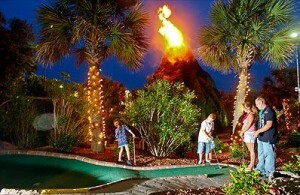 Hawaiian Rumble Mini Golf Open Year Round! Home of the Masters EVERY October! In Myrtle Beach on vacation, be sure to stop into Hawaiian Rumble. Rated the #1 Mini Golf course in the WORLD, this 18-hole miniature golf course is centered around a tropical Hawaiian Garden with a massive 40 foot Volcano in the middle with the relaxing melodies from the best Hawaiian musicians. This entry was posted in Home Posts on February 15, 2014 by admin.